As part of a Minneapolis community project, members of the Seward/Longfellow neighborhoods are creating a mural over the site of a 2010 triple homicide. A lot of work has gone into the planning and doing of this mural. My friend, Nick Longtin, and I are creating a short documentary in attempts to capture the creativity and altruism of this project. This entry was posted in Uncategorized and tagged art, Community, events, seward market on July 22, 2011 by Peter Fleck. Three East African immigrants were shot and killed at Seward Market near my house recently. Before that, I believe the people in my neighborhood felt immune from senseless violence, or even smug about the lack of criminal activity. This entry was posted in Uncategorized and tagged People, seward market on January 28, 2010 by Peter Fleck. Story at MPR on Market’s reopening one week after the homicides. 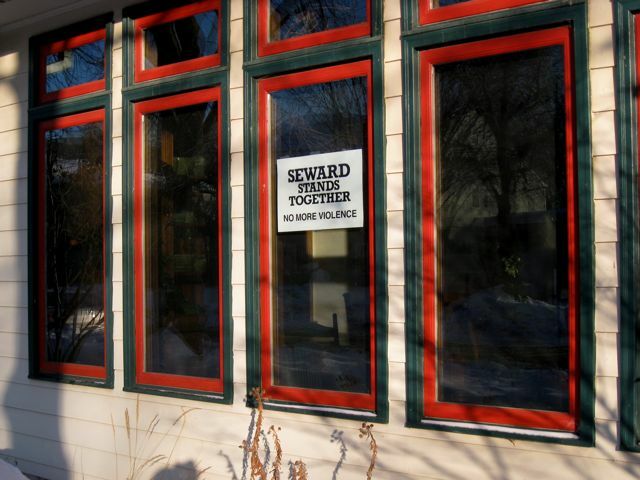 This entry was posted in Uncategorized and tagged Business, seward market on January 14, 2010 by Peter Fleck. Ann Treacy has an article at TC Daily Planet on how communities can use social media to inform communities and share ideas. She focuses on what we did with our Neighbors Forum and this blog. It looks at how the discussion spread from a news article at WCCO to Twitter, then our Forum, then the blog. On the Forum, community member Fran Vavrus suggested a vigil which then became reality the next night. It's hard to imagine we could have organized the vigil that quickly if Fran hadn't planted the seed via the Internet. This entry was posted in Uncategorized and tagged seward market on January 14, 2010 by Peter Fleck. nice mix of community customers. Hours are 9 to 9, 7 days/week. Mohamed Warfa and Osman Elmi were two of the the victims in last week's senseless killings. The family of Mohamed Warfa and Osman Elmi would like to thank the Minneapolis Police, the Maryor of the city, the Somali community, the Seward Neighborhood, media and everybody else who have shared the pain and suffering we are going through. The family is relieved to learn the news that two suspects are in custody. We appreciate the quick reaction and speedy actions of our law enforcement. The family would also like to express their appreciation of the admirable way in which the Somali community and Seward Neighborhood have supported the police in their efforts to solve this gruesome and mindless crime. The family is kindly requesting that the Somali community continue to work with the law enforcement. Mohamed Warfa and Osman Elmi were two young people, full of life and so much to look for in the American dream. They came here to live in peace and start a new life but their lives were taken in the most senseless act of cruelty. No words can describe the shock and the pain the family is going through at the loss of our beloved ones. We will not rest until all those who are respoinsible for their killings are brought to justice. Finally, our condolences go to Anwar Mohamed's family. We share their pain and suffering. This entry was posted in Uncategorized and tagged seward market on January 12, 2010 by Peter Fleck. Signs are available at the Crime and Safety meeting tonight in Seward West Tower (starts at 7PM). They will also be distributed to businesses but I’m unclear if they are redistributing the signs. This entry was posted in Uncategorized and tagged seward market on January 11, 2010 by Peter Fleck.